How to format text colorChange color, gradient, or use a graphic with your text. How to format text shadow and oulineAdd shadow and outline to your text characters. How to rotate text on multiple axesRotate your text for a unique effect. How to format text for a 3D lookUse extrusion to add depth to font faces and outlines. How to format or size words or lettersCustomize the formattting of lines, words, and individual letters. How to format paragraphs with graphicsFormat a paragraph by using the colors of an image in the design of the paragraph. How to add backgrounds to titlesAdd a solid or gradient background or use an image of your choice. How to use a predefined rectangle shape, part 1Loading and modifying rectangle shapes in your titles. How to use flares for subtle accentCreate accents by keyframing flares that accent parts of your title. How to use the spotlight filter toolAccent your presentation with the spotlight filter presets. How to customize the spotlight filterAdjust the spotlight filter to achieve interesting results. How to rotate and scale a graphic with key framesUse key frames to give the illusion of rotation and motion with an imported graphic. Rotating and moving an object in your titleHow to rotate and object and then move it. How to import and format graphic objectsBring in a graphic, rotate it, and add a transition. How to make a horizontal line magically expandUse key frames and resizing for a nice effect with a line. How to use the infinity animation with paragraphsSeven presents of the infinity animation with paragraphs plus tips on customizing any of them. How to use key frames with imported graphicsPrecisely control attributes of imported graphics using key frames. How to change a graphic object with key framesPrecisely control the attributes of a graphic using key frames. How to use key frames with title textPrecisely control the attributes of text using key frames. How to use the float and pop transitionPreview of the six presets in the float and pop animation category. How to customize the Float and Pop transitionCustomize any of the six 'Float and Pop' presets. How to use the six 'Turn' animation presetsHow to implementy the six basic 'Turn' preset animation variations. How to customize the Turn transitionsCustomize any of the six turn transitions. How to use the 12 active camera effectsExamples of how the various 'active camera' effects impact graphics or text. How to use the colored pencil effectUse this effect to change the appearance of objects in your title. Use multiple transitions on one paragraphTips on using more than one transition or animation in the same text paragraph. How to save and reuse titles in multiple projectsSave titles to use them in more than one project. How to match title length with Power DirectorWhy it is important to make sure that the title lenghth matches in Titler Pro and your host program. 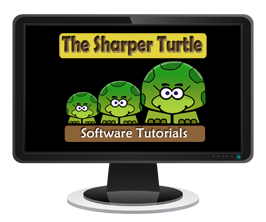 © Copyright 2016|The Sharper Turtle.